Sometimes when we get "too big for our britches," we find ourselves humbled by a natural disaster, world war, incurable disease, economic depression, or widespread social disorder. 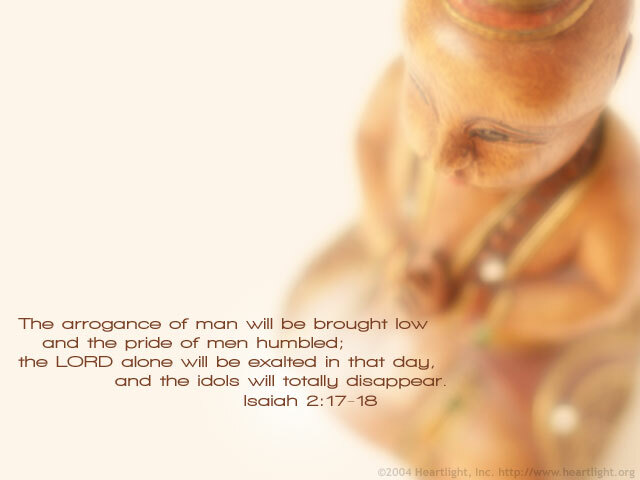 Our arrogance can be a predictor of our own impending disasters. Is there a general principle of our universe at work here? ("Pride goes before a fall.") Or is this the active discipline of God at work? I guess the answer is "Yes!" to both of these questions. Both God and his world remind us that there is so much about our lives we can't control. This passage, however, goes beyond the general principles and it promises an ultimate day when human arrogance will be eliminated and all false gods disappear. On that day, God's children will rejoice and be glad! Until then, let's walk humbly with our God. Dear Father in heaven, please humble me gently. I don't want to lose my keen sense of your presence by becoming too full of myself. Neither do I want to bring disaster upon myself or those I love. Give me an undivided heart of devotion to you out of appreciation for your grace. In the name of the Lord Jesus I pray. Amen.